Self-guided courses satisfy Progress Outcomes 1-5 of the New Zealand Curriculum for “Computational Thinking”. Our courses make lessons come alive in ways students can see, hear, touch and even chase around the room. Read More..
"One of the great features of RobotMagic is that it lets us go from working with languages like Scratch and block based coding to working with real robots in a virtually seamless transition." "RobotMagic was instrumental in helping my daughter learn to code"
"I Love RobotMagic! I've build a video game, programmed an Arduino greenhouse, and done line-following with my Mindstorm." How does RobotMagic teach Computational Thinking? 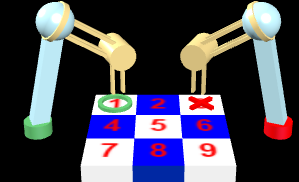 RobotMagic was built by Stanford computer scientists to help teach students how to use computers as tools. We want students to learn how to use computers to solve problems. Instead of passively using devices to consume, we want students to create. Doing this requires students to engage in computational thinking- to think with math and logic, understand data, and debug problems until they're solved. RobotMagic makes this easy with interactive courses. What Courses and Tools are available? RobotMagic combines an innovative 3D environment with an advanced online learning system to improve STEM education. Teachers deploy interactive courses from our library or customize course content with web-based tools. They enroll students or let them self-register for courses. Teachers monitor student achievement with graphs or export results to other learning systems. How does RobotMagic support my Robots? RobotMagic makes robots come alive by ensuring student success. Students start learning skills with guided challenges in simulated environments before progressing to more difficult challenges in the real world. Robot actuators and sensors are accurately modeled to support easy transition between simulated and real-world work. Teachers use RobotMagic to engage small student groups with real robots while the rest of the class learn skills in the simulator. RobotMagic supports Lego Mindstorm NXT/EV3, Arduino, Scribbler, Finch, mBot, BlinkyTape and Aseba Thymio robots. Can I use RobotMagic with Arduino? How do I use RobotMagic in my Makerspace? Make anything you want in RobotMagic! Construct colorful objects in your browser and watch the 3D printer as it builds what you designed in seconds. You can also design mechanical contraptions and bring them to life with gears and motors: clocks, differentials, analog computers. Shape and pose a human figure however you want and then animate it to create realistic movements like dance, sports and more. Achieve realistic movements by coordinating joints. In the Robot worlds you can combine multiple robots and 3D content for even more fun! Does RobotMagic support Block Coding?